It’s usually an ‘Arsenal’ thing to put up a crappy performance shortly after an embarrassing defeat but when you think about the fact that Manchester United won their game against Sunderland (pathetic officiating saw the wrong guy pick up a red card), it was important for the Gunners to get three points to return to third place. Manchester City’s loss to Liverpool also made the prospect of second place interesting. 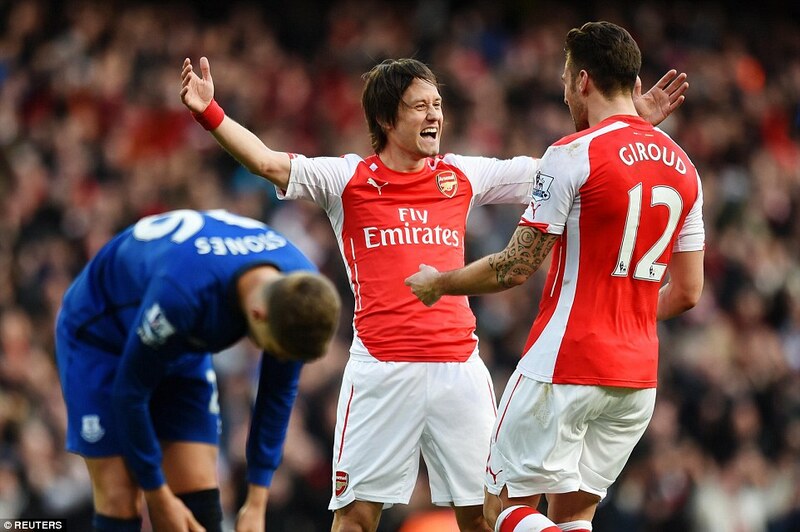 Everton had lost six of their last seven away games and the Gunners were hoping to add to their woes. However, it was the away side that drew first blood when Romelu Lukaku robbed Gabriel and bore down on goal. David Ospina did really good to parry off his effort before charging Lukaku outside his box to clear the ball out for a throw in. The timing of his decision had to be key because if he got it wrong we would have seen Wojciech Szczesny back in the side. Arsenal should’ve grabbed the lead when Alexis Sanchez dinked a brilliant ball to Olivier Giroud but his glancing header missed Tim Howard’s goal by a lick of paint. Laurent Koscielny got caught up further up the pitch and Lukaku surged forward before he was blocked courtesy of a fantastic tackle from Gabriel. Arsenal finally got the lead when Giroud reacted quickly (just like the Middlesbrough game) to blast the ball past Howard. If a defender was at the far post, it would have cleared it but Arsenal fans didn’t care. There was a lot of anxiety at the Emirates and that strike lifted the spirits. 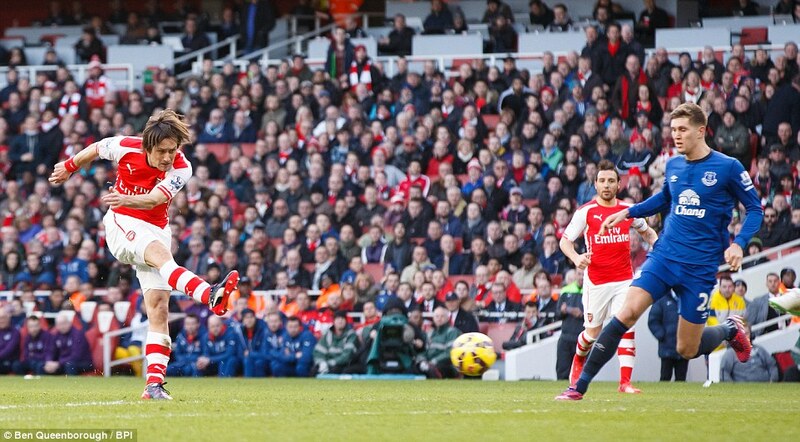 Cazorla had a little sniff at goal and used his left foot to fire a shot that was parried away by Howard. Mohamed Besic almost suffered the ignominy of scoring an own goal but his goalie spared his blushes. At the start of the second half, Everton attacked with more urgency and almost got an equalizer when Lukaku missed a chance at point blank range thanks to some brilliant goalkeeping from Ospina. Aaron Lennon have a chance at goal but Ospina was on hand to make another superb save. Wenger brought on reinforcements to shore things up and the match clincher arrived by Tomas Rosicky blasted Ozil’s cut back to put the game beyond doubt. 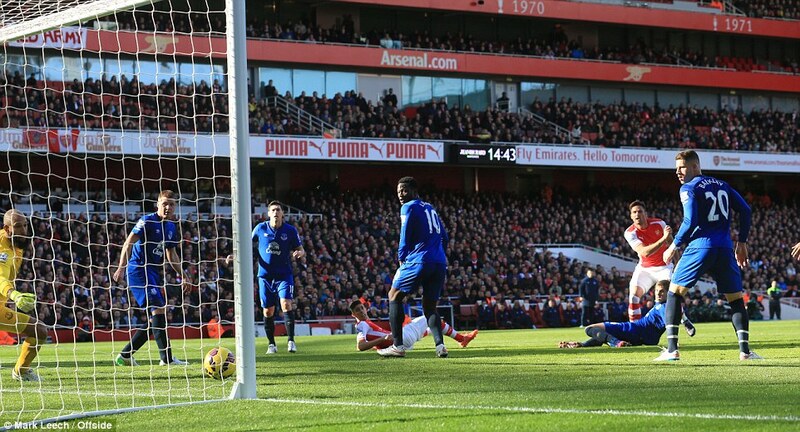 There was a stroke of fortune for the goal as it deflected off Phil Jagielka but Arsenal didn’t care. At the sound of the ref’s whistle, the Gunners were back in third place and it’s going to be an intense battle to qualify for the Champions League. Posted on March 2, 2015, in Arsenal, Football, Match Report, Premier League and tagged Arsenal, Everton, Football, Premier League. Bookmark the permalink. Leave a comment.